Beetroot kurma - thick creamy pink colour gravy for chapathi, poori and dosa. This kurma would surely impress your kids with its beautiful colour. I like to prepare kurma with different combinations. 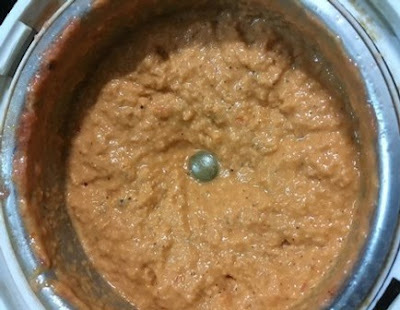 Based on the coconut paste, this kurma is also prepared, with easy cooking methods. 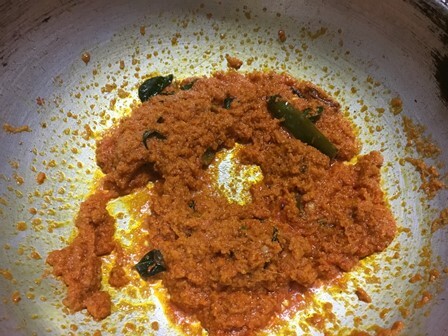 Usually we add cashew nuts or fried grams in the coconut paste and then the masala paste is prepared. But for this kurma, I add the cashew nut paste at the end. The grated coconuts are ground along with tomatoes, ginger and a few spices and sauted in the oil. Then the cooked beetroots are added and then our basic ingredients like chilly powder, garam masala powder are added to the kurma. Finally the cashew paste and milk are added for thickening the kurma. 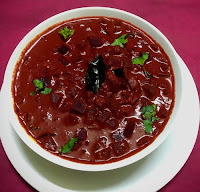 Beetroot kurma - thick creamy pink colour gravy for chapathi, poori and dosa. This kurma would surely impress your kids with its beautiful colour. Wash and peel the beetroot. Cut them into small pieces. 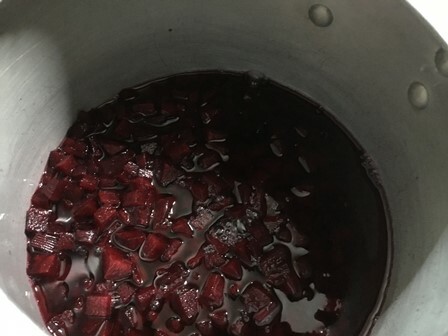 Add these chopped beetroots in a pressure cooker or pan and add 1/2 cups water. Pressure cook for 3 to 4 whistles. Take a small chutney jar and add the ginger, tomatoes, cloves, fennel and star aniseed. Grind them without any water and add the grated coconuts and grind it to a smooth paste. Transfer the paste to a bowl and add the cashew nuts and grind it nicely. 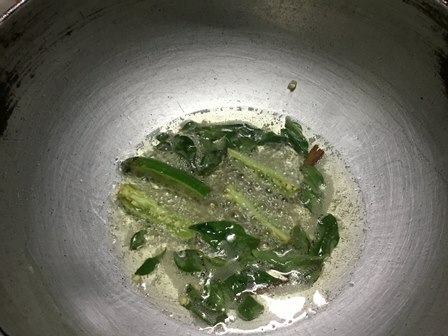 Heat 3 tbsp oil in a kadai and add the cinnamon, curry leaves and slit green chilly. Next, add the ground coconut paste and saute them well. Stir it continuously. When the oil starts to separate add the chilly powder and the cooked beetroots along with the water. Add the required salt. After 5 minutes, reduce the heat and add the the ground cashew paste and milk. 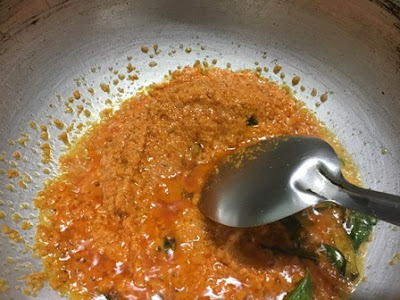 Mix them well and add garamasala powder. Allow the kurma to boil for 5 minutes. 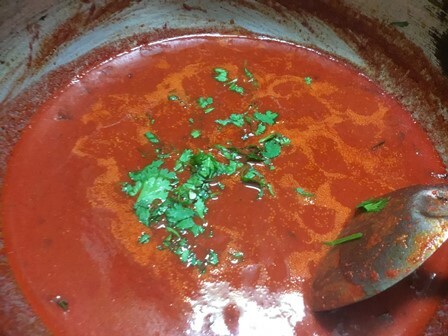 Allow for a gentle boil and add the chopped coriander leaves and turn off the heat. Wash and peel the beetroot. Cut them into small pieces. Add these chopped beetroots in a pressure cooker or pan and add 1/2 cup water. Pressure cook for 3 to 4 whistles. Allow the pressure to settle down naturally. Take a small chutney jar and add the ginger, tomatoes, cloves, fennel and star aniseed. Grind them without adding water. 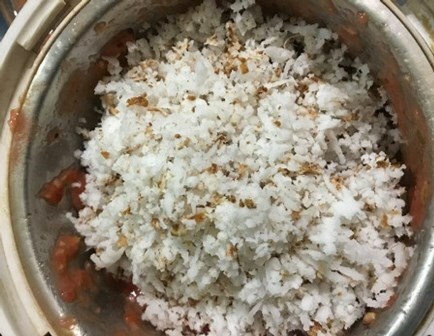 Add the grated coconuts and grind it to a smooth paste. No need to add any water for grinding. If it is difficult to grind just sprinkle 2 to 3 tbsp water and then grind it. Grind it smoothly as in the picture. 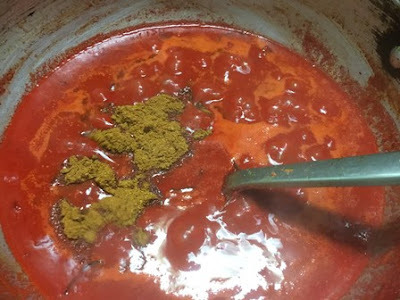 This ground paste has a very bright colour and fresh flavour from the ginger and other spices. Transfer the paste to a bowl and add the cashew nuts. Grind it nicely with 2 tbsp water or milk. Heat 3 tbsp oil in a kadai and add the cinnamon, curry leaves and slit green chilly. 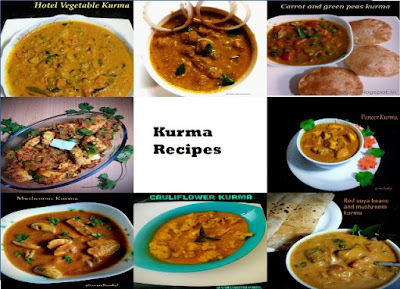 For this kurma I have not used onions for sauteing or grinding. If you want, you can add the chopped onions now and saute them well. Next, add the ground coconut paste and saute them well. 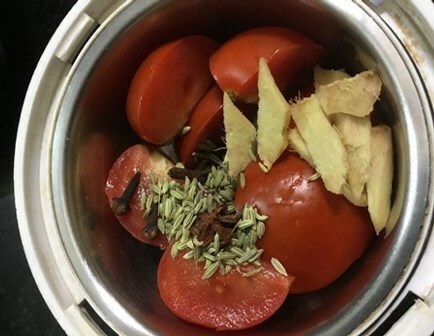 For 3 to 5 minutes, stir it continuously until the raw smell of the ginger and tomatoes disappear. The ground paste must be sauted well as in the picture below. 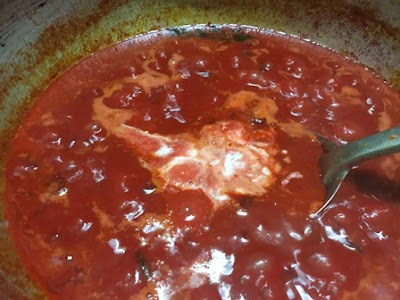 When the oil starts to seperate add the red chilly powder and the cooked beetroots along with the water. 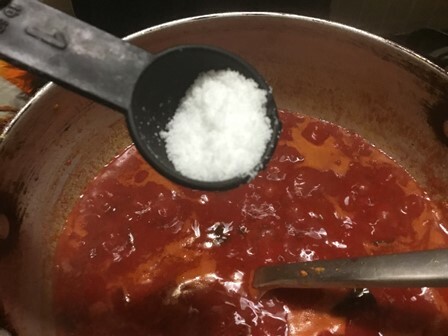 Add the required salt. Mix them well and and allow the kurma to boil for 5 minutes. After 5 minutes, add the ground cashew nut paste. 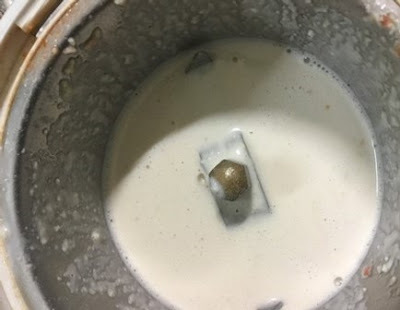 Add the garamasala powder and milk. Reduce the heat, allow for a gentle boil and add the chopped coriander leaves and turn off the heat. Transfer the kurma to the serving bowl and serve it warm with chapathi, poori or dosas. 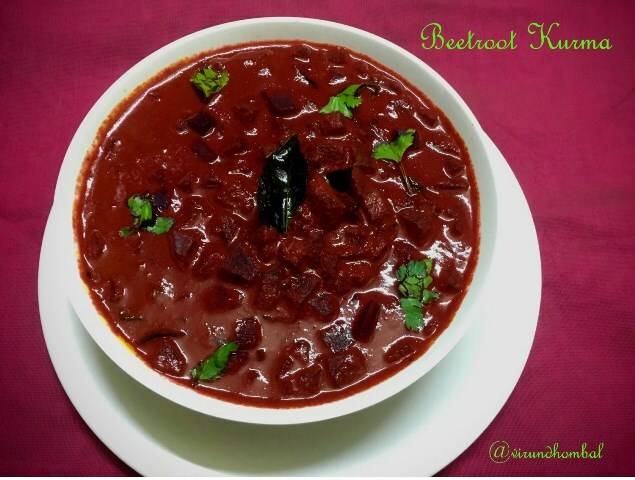 If you try this recipe for Beetroot kurma send us your comments below and share the recipe for your friends and family.